MANSFIELD, Texas – August 22, 2018 – Fat Daddy’s Mansfield is celebrating 10 years of live music with Fat Fest on Saturday, Sept 22. Headlining the festival is platinum selling artist Uncle Kracker. The Michigan singer/songwriter made his solo debut with 2001’s #1 smash, “Follow Me,” kicking off a run of top 10 hits like “In A Little While,” “Smile,” and of course, 2003’s cover of Dobie Gray’s classic “Drift Away” which set a Billboard record for most weeks at #1 on any chart. 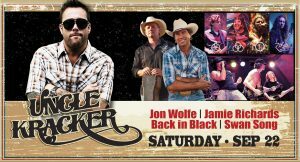 Jon Wolfe, Jamie Richards, Back in Black and Swan Song will also perform at the festival. From small town Oklahoma, to the dance halls and honky-tonks of Texas and Oklahoma and beyond, the power of Jon Wolfe’s music has touched the hearts of others. Wolfe’s garnered eleven consecutive Top Ten singles (seven have hit No.1). Any Night in Texas (2017), Wolfe’s most recent and proudest collection of songs to date, landed at #3 on iTunes Country, #15 on Billboard Country, and continues to burn up the charts. Wolfe invites country music fans everywhere to dust off your boots, spin his music, and come see the electrifying live show that has everyone talking. Joining Wolfe is fellow country artist Jamie Richards whose known for being a singer that can deliver a range of emotions. Richards has climbed the ranks of country music, one rung at a time and carved out a very unique and comfortable place in the Texas music scene. As he gears up to release his latest album, Latest & Greatest, he is looking to reach new audiences as well as reconnect with those who have followed him since the beginning. “Whether you’re a new fan looking for real country music or a long-time fan waiting to see what happens next, there is a song on here for just about anyone,” said Richards. Classic rock fans will also have something to cheer about when local AC/DC tribute, Back in Black and Led Zeppelin tribute, Swan Song, take the stage. “For the past 10 years, Fat Daddy’s has been bringing the best in live music to the DFW area. We could not be more excited to have such a great line-up of artists to celebrate this milestone. We hope everyone in the metroplex will come out and join us,” said Vice President of Operations, Joey Dello Russo. Fat Daddy’s Sports & Spirits Cafés are corporate properties of AngMar Retail Group, headquartered in Mansfield, Texas. The retail group owns and operates 11 retail locations, which also include the following brands, Smokey MAE’s BBQ, Southern Oaks Golf & Tennis Club, Marksmen Firearms & Outfitters, AutoWorx and House of Hotrods.